It's almost nine o'clock. Two chits. Eight tables. The rubble of the dinner rush: bent coasters on the seats, a nearly empty pint glass at the bar, crumpled receipts by the cash machine. And if you're a manager, those gnawing questions: What did we ring? Do I need to start cutting staff? For managers, this is the time of day--one of several times of day, in fact--when it's critical to know how profitable your restaurant is. Knowing this information will help you make educated decisions about sending staff home based on that winning automated schedule you did two weeks ago. The trouble is, a lot of managers don't do these calculations through their shift, and it's unfortunate because it's both easy to do, and it's an incredibly effective way to control labor costs. So, using our team's years of experience working in the restaurant industry, we're going to show you how you can use not just one but two metrics in tandem to run profitable shifts. For years, if restaurant managers did any calculation at all to see where they were at in the night, it was the dollar-per-man-hour calculation. However, the more common approach most restaurants use is a labor percentage metric because it is a true measure of profitability especially when wages are factored in. 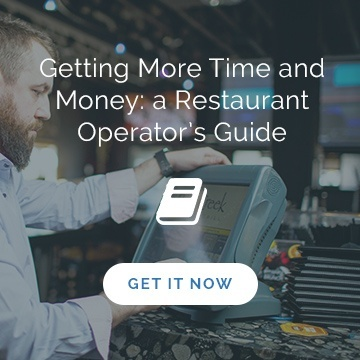 Well, we believe restaurants should be using both dollar-per-man-hour and the labor percentage metrics, especially in the minutes after rush when you have to make calls that could turn the night into the black, or the red. How you calculate it: Sales divided by hours. For example, if you're at $1,400 three hours into the night shift, your calculation is $1,400/ 3 = $466* per man hour. Pretty amazing to say the least! *NOTE: Be mindful of what a healthy dollar-per-man-hour cost looks like at your restaurant. Too high and you may be sacrificing customer service for added profits. Too low and you'll be wasting profits. Why it's used: Once the staple of profit calculations, dollar-per-man-hour focuses on profits and how much you're selling. It's pretty easy to determine what your dollar-per-man-hour is, and it has its advantages, but it's become a bit of a forgotten art in the restaurant world. *TIP - Avoid using a blanket department wage i.e. $8/hour. For the best level of accuracy use exact employee wages when doing your calculations. In just a 3 hour shift, a server that makes $15/hour vs. $8/hour would be an additional $21 in labor cost. Why it's used: Labor percentage focuses on how much you're spending on labor costs. In today's world, restaurants need this metric to build accurate forecasts early on, to control labor costs during restaurant scheduling, and to see an accurate representation of their projected labor spending. 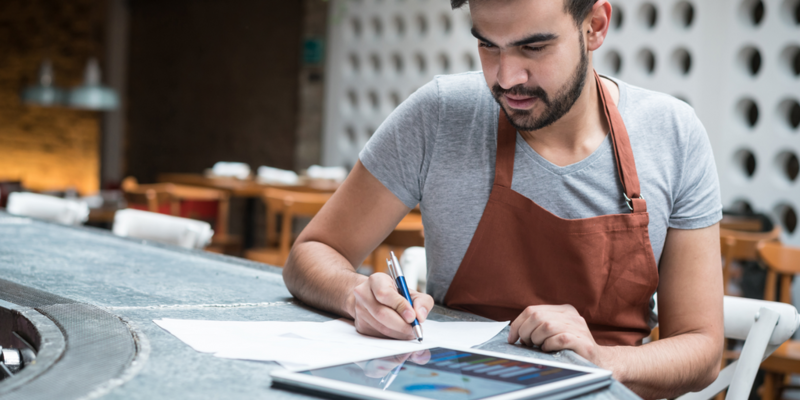 Most restaurants aim to spend around 25-30% of sales on labor, but determining your restaurant's ideal labor percentage number--and sticking with it--is part fine art and part the process and tools you use to stay on track. Learn more about our unique forecasting powers in our post: How Ameego Predicts the Future: Introducing our New Forecasting Capabilities. The thing is, both of these metrics have their place, and can be even more powerful when managers are using them together. When you're able to use historical data gleaned from your POS system to create accurate forecasts, including labor spending targets, you're able to look at the big picture and set goals so you can maximize your profits. 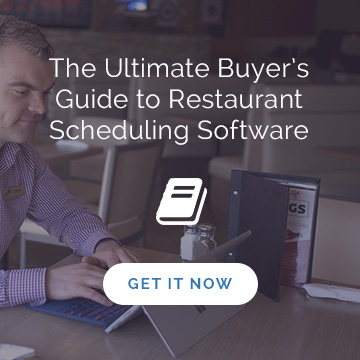 Ameego's restaurant scheduling software, for example, allows you to see your labor percentage as part of your budget as you're building out the perfect, one-touch schedule. It also bases the forecast on actual employee wages to ensure the greatest level of accuracy in projecting costs. Think of this metric as one you'd do in budgeting/planning phase to reach long-term goals. As much as that accurate forecast and labor targets are set based on historical data, things change, things happen, things need your attention now. That's why we recommend having at hand your dollar per man hour metric not just daily, but throughout the day. This process will enable you to gauge how you'll use this shift's profits to meet your day's goals and make immediate decisions, like whether or not you can send a hostess home and go down to one bartender. Do the dollar-per-man-hour calculation on the fly at the tip of every rush (often twice through the dinner hours and once at lunch), as soon as most sales are in, so you know the urgency at which you need to cut staff from the floor, or if you can afford to keep people around a while to finish their side duties and set the next shift up for success. It also tells you if you need to encourage team members to do a better job of selling for the rest of the night to get closer to your targets. Ameego also gives you instant access to not just guest counts but also meal counts, right down to the 15-minute interval, so you can see how even more detailed numbers stack up against what you'd projected for the day. Book a demo to see how this game-changing feature works! Make sure you're getting accurate, instant sales from your POS. 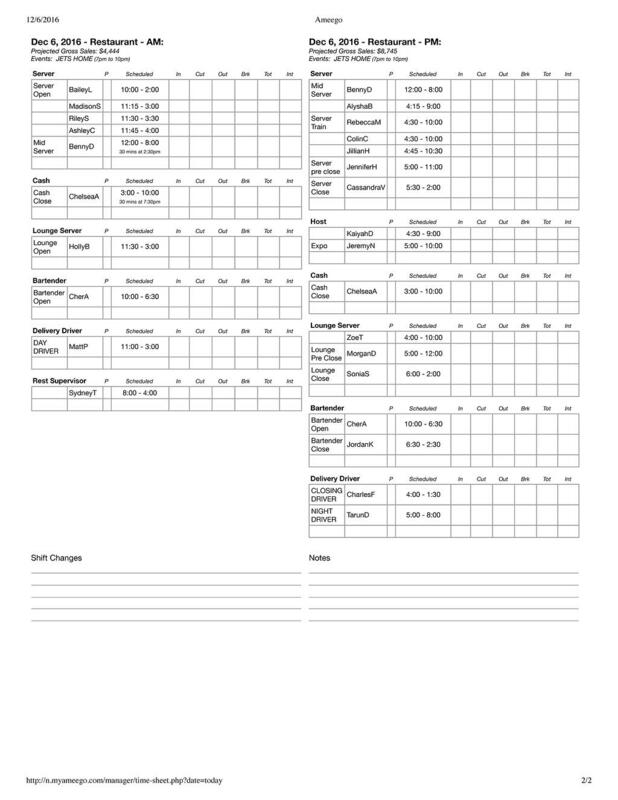 Use daily hard copies of timesheets, aka the daily roster, (like the one listed below) which shows the start and end time of each employee as well as each day's sales projection. That way you have that sales target right in front of you and can easily do some quick math to determine your actual dollar-per-man-hour on the spot. With team members physically signing in and out, you've got a second, legal record of hours work to supplement their swiped in hours. Ideally, your management team is starting every shift with a sense of both metric targets--labor percentage and associated dollar-per-man-hour. Using these numbers together, and in the ways we’ve described, helps you reach those all-important daily, monthly and quarterly goals. 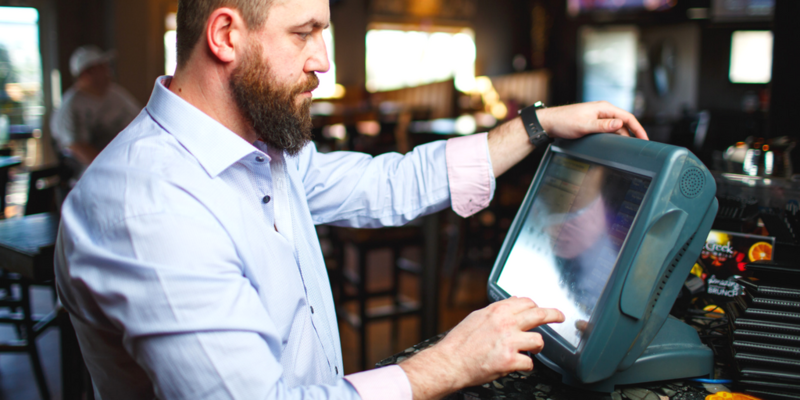 How can your restaurant run smart shifts with perfect schedules and accurate forecasting? Book your demo of Ameego's online restaurant scheduling software!